I love entertaining. It is fun to get together with family and friends and enjoying each others company, great food, and treats. Even amidst the busy holiday season, we decided to have a fun Holiday party for my kids and their friends. It was so much fun. They all had a great time and we can’t wait to do it again. The kids all enjoyed food and games and we laughed and had a great time. The highlight of the night was the Baskin-Robbins Ganache Poinsettia Cake and Peppermint & Winter OREO® Cookies Polar Pizza. These two treats brought our party to the next level. The kids were so excited for the ice cream cake and many of them wanted second and third servings because it tastes so good. Find time to plan your holiday party and enjoy a Baskin-Robbins Ganache Poinsettia Cake with your family and friends. Invite a lot of people and ask them to RSVP so you know who is coming. Not everyone will be able to attend, so by inviting more people you will get a normal turnout. Send out the invitations a week in advance, then follow up with people you haven’t heard from two days before so you know what your count will be. Plan it for reasonable hours, preferably on a weekend so people can relax and have fun. Make sure you have lots of food and drinks for everyone. Plan fun party games like Pictionary, Pie Face and Uno for the kids or cards or other fun board or die games for the adults. Leave some downtime for hanging out and visiting. Have a movie or music playing in the background to fill the lull. Have a great party dessert like the Baskin-Robbins Ganache Poinsettia Cake and the Peppermint & Winter OREO® Cookies Polar Pizza. These are just a few things you can do to have a successful Holiday Party! Of course, the best thing is just to have fun and enjoy your company and treats. That is why we picked up Baskin-Robbins Ice Cream treats. They are perfect for any occasion, and our Holiday Party was a hit because of it. Right now you can use this Baskin-Robbins Coupon. The $2.00 OFF Polar Pizza Dual Coupon can be used when you order online and in-stores! 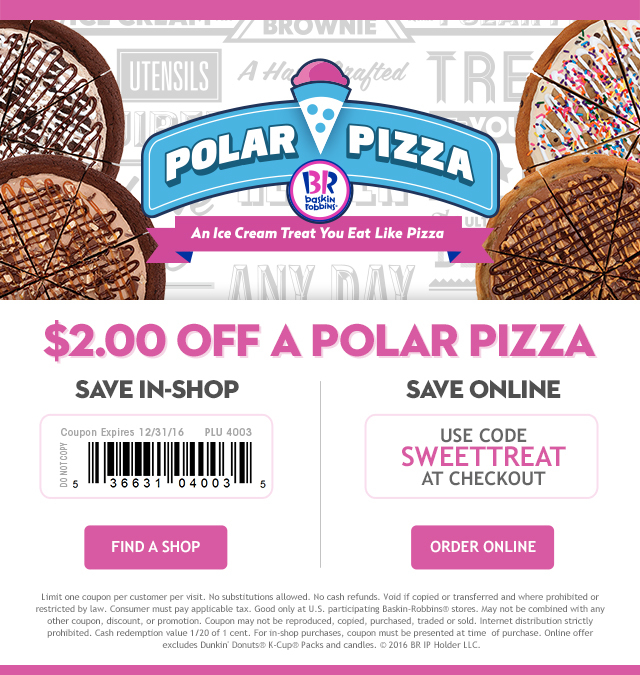 The Baskin-Robbins promo code – SWEETTREAT expires 12/31/16. Baskin-Robbins frozen treats are so good and my kids ask for them all the time! Be sure to try the limited time treats Ganache Poinsettia Cake, Peppermint & Winter OREO® Cookies Polar Pizza, and Peppermint Bark in the Dark ice cream. Oh my, that Ganache Poinsettia Cake looks delicious. Looks like a fun dessert to cut into. Thank you so much for the savings! I have wanted to give one of these cakes a go before and this is the perfect opportunity. This cake looks so delicious! I have always wondered about how the Baskin Robbins cakes look and they don’t disappoint. I always worry with throwing such a big party that I will run out of food. These are great tips! Looks like a fun party and the cake was absolutely looks yummy! Thanks for the tips I will keep this in my mind. this cake looks delish. i love the tips i will pass them along and also use a few myself. thanks. I love Baskin Robins!! These are great tips for holiday parties, I know that we love a good ice cream cake when we have get togethers! I got distracted by that marvelous cake. I’ve never really hosted huge holiday parties but this list will be helpful when I do later on. Thank you! These are great party tips. We love Baskin-Robbins. Haven’t tried their pizza yet but their ice cream cakes are our go-to holiday dessert. Polar Pizza looks delicious! These are great tips for successful holiday parties! I have a hard time going to parties that are late at night, my kids have a routine I like to stick to. Otherwise they are particularly cranky and then I can not have fun at a party. That looks so good! I’m sure it’s going to be a huge hit at parties. It’s njce to be able to plan parties without putting too much pressure on yourself or your guests. What a fantastic coupon offer. I love the look of that choc ice cream cake as well so tasty! Great tips here! My mistake when ever I do a party is that I never have chance to enjoy it as in to busy rushing and sorting etc so gonna keep these tips in mind for my next one and that cake looks amazing!! Looks yummy upon reading this. A must have in every party with your family and friends. This cake looks so delicious! I’d love it! Baskin Robbins has such great ice cream. I also loved Ice Cream cake and this is one of my favorite desserts. And to think that it was from Baskin-Robbins, I know it was more than I expected for. But I haven’t tried the pizza ice cream, I just wondered if it comes with cheese. What a wonderful ice cream cake! My mouth is watering right now. I can’t make a party with a cake like this one, I want to eat it ALL hahaha. That ice cream cake looks so good. This would be great to have for any party.